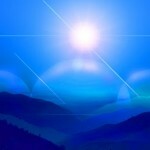 The “Sun” represents that which you perceive more clearly in the light of day. By “the light of day” we mean that which you can easily perceive as it is “lit up” above or before you. Therefore, this perception represents that which you have chosen to perceive with your conscious mind. On the other hand, the Moon reflects the circle of light in the darkness of the night. This “circle of light—to dark—to light” is that which you have within your inner consciousness, which is often hidden in your unconscious mind. By “unconscious mind” we mean the memories, experiences and the inner knowing that you have consciously, or unconsciously, chosen to hide from your daily life. When you are ready to perceive that which you have chosen to hide from your conscious memory, you will be able to allow your inner self to communicate with your outer self. Then, you will regain your innate inner and outer expressions of your physical self, as well as within your non-physical consciousness. However, whether your consciousness is shinning before you as in the light of day, or hiding inside the inner shadows of your unconscious self, your consciousness—your state of consciousness—will affect your daily life in the daytime and your inner life during sleep or deep meditation. In fact, it is via deep meditation while in your “daily life” OR within your “dream life” that your consciousness can communicate with your physical self. If you chose to call in greater information about your self, your goals, and any inner guidance you desire, you will need to go “inside” to find the answers. Yes, it is true that conversing with family, friends, and/or a therapist can assist you to see that which you have consciously or unconsciously hidden from your daily, waking self. However, these secrets from your self will eventually arise in your daily life, your choices, and with your friends and/or family. There are some who never share their inner self with others, but that creates a very deep loneliness. This loneliness is because they have isolated who they think they are from others. 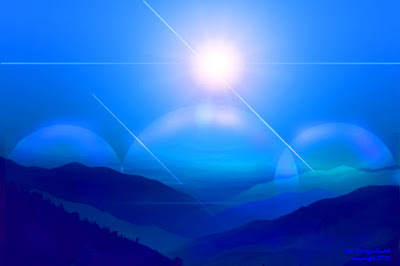 We, the Arcturians, say, “who you think you are” because when you open to the LIGHT of your self, you will no longer need to find your “self” by reflecting it off of others. In other words, you will no longer need to seek attention or needs from others, as you have opened up, at least, some of your inner secrets to your OWN SELF. When you are able to be honest with yourself by allowing your “inner light” to shine ON you, your secrets are no longer secret from your self. When this happens, you may feel embarrassed, ashamed or sad. It is obvious why you may feel ashamed or sad, but why would you feel embarrassed? The answer is that you have NOT come to peace with this part of your so you may feel ashamed. We, your Galactic Family, want you ALL to know that ALL of you have higher dimensional expressions of your SELF who reside in the higher dimensional worlds and/or Starships. Most of you chose to forget your Galactic SELF when you took an earth vessel to assist Gaia, or to clear old karma you are ready to release. Therefore, the decision to remember your higher dimensional SELF is a sign of your own inner strength. Just as you may look from a mountain top down into the valley below, your higher dimensional SELF can look down from the fifth dimension into the fourth and third dimensional experiences of the “Earth Mystery School” that you have created for your self. We say “school” because you would only choose to incarnate on poor suffering Gaia within this NOW if you wanted to release some old karma and/or because you wanted to assist Gaia with Her monumental mission of ascending an entire planet from the third dimensional frequency of reality into the fifth dimensional frequency of reality. If you are reading this message, it is likely that you are among those who have chosen to leave your Homeworld in the fifth dimension and beyond to come to Gaia to assist Her with the great challenge of releasing the dark ones (Illuminati) back to their “site of origin” so that they can better assist in awakening the humans. The problem is that the Illuminati uses these lost humans, who live in daily fear and/or lack of love for their home planet, as their helpers to keep Gaia in a state of constant damage and/or danger of planetary destruction. Gaia was, and still is, a VERY brave planet to volunteer to serve as a “school for human evolution.” This “school” was a wonderful idea until the Lost Ones came to Earth. These Lost Ones (wearing human forms) have come from their own homeworlds, which they destroyed. Therefore, they needed another planet on which they could inflict their selfish and very bad behavior. What that means is that too many of the humans, who were meant to be the most evolved beings on the planet, have been pulled away from the LIGHT of Power WITHIN and into the DARKNESS of Power OVER. These dark ones brought so much darkness onto Gaia’s planet that many of the humans (who were meant to be Gaia’s Caregivers) feel OUT of the Light and INTO the darkness. Once a human falls into the darkness of “power over others,” it can take them many lifetimes to remember their true Higher SELF who functions only from Multidimensional LOVE. We Galactics, who is on the Starships around Earth, (which are usually invisible to third dimensional humans) have come to Earth to assist Gaia with Her Planetary Ascension. Gaia would normally be ascended (meaning fifth dimensional) by this NOW if it had not been for Her being DEEPLY wounding every day and in many ways by the humans who perceive Gaia as a thing to which they can do anything. These Lost Ones also have NO sympathy for the humans who suffer every day. These Lost Ones care only for themselves and for the “money,” which they will do anything to procure. We are sad to see how too often “money” has more power than love. Why would pieces of paper that are minted by humans, or even gold that was stolen from the body of Gaia, have such great importance to humans? The Ascended Masters once wore a human form, but they ascended far beyond third dimensional Earth and the third dimensional birth and death of their earth vessels. These Ascended Masters are able to, and constantly do, assist Gaia from the higher dimensions, as well as through humanity’s awakened and awakening Multidimensional SELF. However, the “power over others” that hides in the darkness has successfully convinced many humans that “what you have” is more important than “who you are!” Fortunately, more and more members of humanity are finding the courage to go into their own, real or imagined, darkness to find their own Inner Light. Most humans were born with Inner Light, but some had such difficult lives that they fell into the darkness. Then there were the Dark Ones who are secretly jealous of the ones who live in Light and Love. You see, the Dark Ones can steal many things, but they cannot steal love from another. Love travels in a circle. Once love flows into a welcoming circle, it grows and expands from the experience of not just the FEEL of LOVE, but most of all the feeling of GIVING LOVE. Yes, there are too many forms of “selfish love,” or “fake love” but, since all love travels in circles, that brand of love also returns to the sender. LOVE travels in circles and it always comes back to those who have sent love out to share with others. “Sharing Love” is when love lives more clearly in the Light. On the other hand, selfish. or fake love lives in fear and darkness. The deepest beauty of True Love is that it is the best way to heal, not only the one who is wounded but also the one who is healing. Since True Love flows in a circle, the love that is sent out to others will eventually return to the sender. In other words, the LIGHT of True Love can pierce the DARKNESS of sorrow, selfishness, and pain. Many have learned about love, and many have not. But NOW the inhabitants of Gaia have a great challenge. Those who are only able to love money and things have done GREAT damage to beloved Gaia. Therefore, those who can truly love Gaia are being called on to SEND THEIR LOVE TO GAIA. However, this love that they send to Gaia cannot be passive love. The love that humanity is called on to send to Gaia is Active Love. Active love means that each human member of Gaia (as most, if not all, the damage to Gaia was initiated in some manner via humans) is called on to discover the manner in which each and every human has gone inside to find the manner in which they said they would assist Gaia before they took their present incarnation. This assistance for Gaia is based on the same Unconditional Love that Gaia has sent to humanity. It is the NOW for humanity to THINK ABOUT GAIA FIRST. After all, what would be worse for humanity than to experience the destruction of their home planet? If one just looks at how many “disasters” have occurred on Gaia over just one human lifetime, the would fully understand why the Galactics have chosen, at great sacrifice, to take a human earth vessel in hopes that somehow they could influence humanity to PUT MOTHER EARTH FIRST! After all, if Earth becomes uninhabitable, where would humans put their fancy houses, their expensive toys, modern cars, and huge boats? All these human toys are harming Gaia in more ways that humans wish to know. WHEN will you remember that you must start your service NOW?